Although eye strain can cause discomfort, it usually isn’t serious and goes away once you rest your eyes. 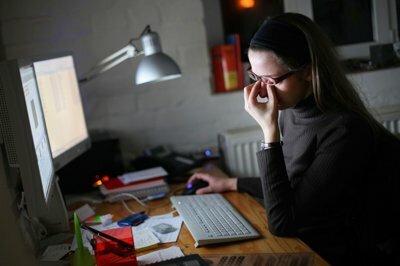 You may not be able to change the amount of time you’re in front of a computer at work, or the factors that can cause eye strain but you can take steps to reduce it. Rest your eyes– Regularly look away from the screen and focus on some object in the distance (further than 6 meters) – it relaxes the focusing muscles in the eyes which reduces eye fatigue. Take breaks from the computer- It is important to take regular breaks from the computer to reduce computer eye strain. Use adequate lighting- Eye strain is usually caused by sunlight or bright lighting in the room. Use curtains or blinds to reduce the brightness. Reduce glare– Make sure no lights behind you are reflecting in the VDU screen. Anti-glare (anti-reflective) coatings on lenses helps reduce the glare. See our animation! Upgrade your monitor– Old CRT monitors flicker which is one of the main reasons for eye strain; replace them with modern LED screens. Change the monitor’s settings– Make sure the brightness is the same as your surroundings and the size of text and contrast is comfortable to read. Black text on a white background is the most comfortable. Reducing the amount of blue can help as blue light has a shorter wavelength and this is associated with more eye strain. Change your work station-Having to look from a screen to a piece of paper can strain your eyes. Make sure your chair and desk are at the right height for you. Your computer monitor should be 20 to 24 inches form your eyes and the centre of it should be 10 to 15 degrees below your eyes. Wear lenses specifically designed for computers– If you have contacts, think about wearing glasses instead as contact lenses can become dry and uncomfortable. Ask your optometrist about special lenses for computer work.